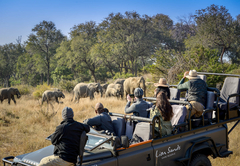 Lion Sands Private Game Reserve is a highly recommended Mpumalanga game lodge providing a wildlife experience for discerning tourists visiting Wild Frontier. 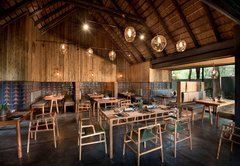 The International Award Winning Lion Sands is situated in one of the finest wilderness areas in the Southern Sabi Sand Game Reserve, the only private reserve to have access to the perennial Sabie River, which it shares with the Kruger National Park. The property’s geographical location is an area of great diversity of both fauna and flora and affords guests the opportunity of partaking in our unique activities based around the river system and surrounding area. 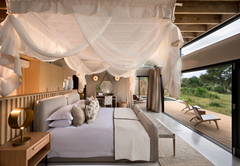 Lion Sands is situated in one of the most pristine wilderness areas in Southern Africa. Lion Sands Ivory Lodge. The simple and uncluttered interiors achieve a contemporary, Afro-European elegance. 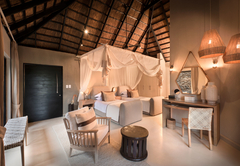 The Lodge is about overriding exclusivity with complete privacy, where each suite is operated as its own private villa and where private dining, spa treatments and complete relaxation is the norm. 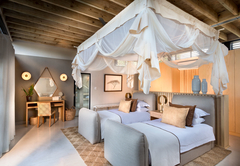 The 6 luxurious suites comprise of their own courtyard, lounge with fireplace, viewing deck and private swimming pool. The bedroom and en-suite bathroom is fully air-conditioned and has an additional outside shower. The suites are 165 m2 in size and are positioned far apart to ensure a sense of pure exclusivity and privacy. 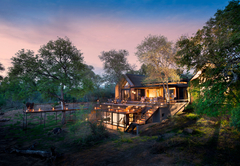 The reserve is private and exclusive to Lion Sands guests only with both Lion Sands River Lodge and Lion Sands Ivory Lodge located on the banks of the Sabie River. Lion Sands is 4th generation family owned and managed, where the highest standard of guest service and experience have been handed down from generation to generation. 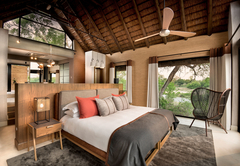 Lion Sands River Lodge, which is downstream of Ivory Lodge, facing due East, is nestled under a canopy of trees dating back almost 800 years, catching the sun as it rises over the Kruger National Park. 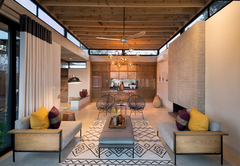 The Lodge is about spirit, warmth, nature and relaxation. 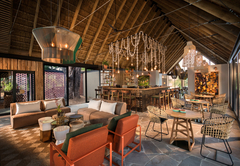 This 18 room luxurious lodge comprises of the following: a private lounge and bar, 2 swimming pools, wooden viewing decks, a secluded bird hide, private hammocks, health spa, curio shop & both an indoor and open-air dining area. 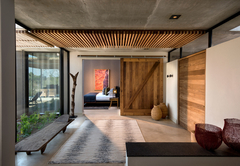 All the air-conditioned bedrooms have en-suite bathrooms, with an indoor & outdoor shower and separate bath, mini bar and private wooden viewing deck overlooking the Sabie River. "Lalamuka" means unwind in Shangaan and that is exactly what it is all about. An array of body and facial treatments are available to guests to assist in getting rid of those urban stresses. A wooden platform has been constructed high up in the top of an ancient Jackalberry tree. 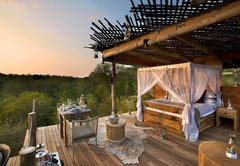 Amongst the branches, the most romantic bush bedroom is set up to accommodate a couple for the night, with secure access and as many of the room comforts as are practically possible. 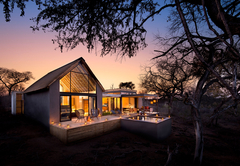 The guests are driven to the hide after dinner and "settled" in for the night where after the ranger returns to the lodge (15 minutes away) leaving the guests in complete privacy to spend a night under the stars. An absolute must for visitors who come to Lion Sands. The activities programme has been developed to enhance the guest's safari experience by enabling the guest to tailor-make their stay with us. The activities are all offered in a flexible and convenient environment. 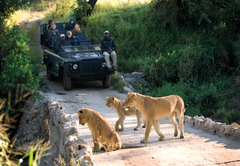 The activities programme is uniquely exclusive to Lion Sands guests only. 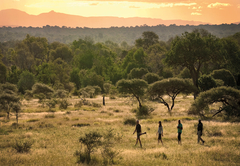 Activities included in the daily tariff are: Open Land Rover game drives; Bush Breakfasts; Bush Walks; Fishing; Wildlife Lectures; Picnic lunches; Hippopotamus Tour; Bush Dinners; Astronomy and Full-Moon Walks. 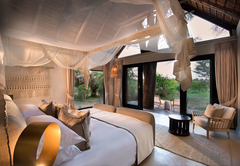 Additional Activities which are available but not included in the daily tariff are: Private Land Rover hire (Exclusivity, Specialist Photography, Bird watching); Health Spa; Clay pigeon Shooting; Sleep-out Hide. By Arrangement visits to: Kruger National Park (KNP) Golf Course; Helicopter flights to the Blyde River Canyon, Ballooning Safari, Hazyview and a visit to a Cultural Village. Luxury Suites that comprise of their own courtyard, lounge with fireplace, viewing deck and private swimming pool. 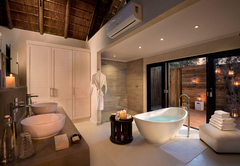 The bedroom and en-suite bathroom is fully air-conditioned and has an additional outside shower. 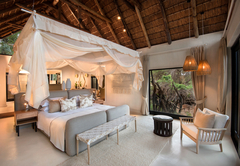 Luxury Room with en-suite bathroom, lounge area with mini bar and wooden deck from which to appreciate the wilds beyond. 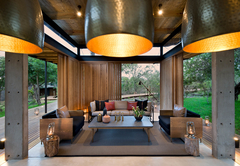 River Lodge suites are located further from the public areas and are therefore more private. Superior Luxury Room are larger in size, with open-plan bathrooms and outdoor showers. 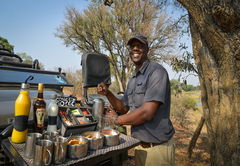 All meals, teas/coffees, minibar in room, inclusive drinks and selected snacks (all soft drinks and selection of beers, spirits and house wines), two game drives daily , game drive refreshments and snacks, specified inclusive safari activities, Skukuza Airport transfers, Wi-fi in public areas. 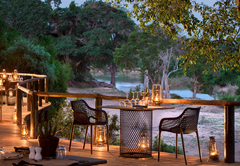 All meals, teas/coffees, maxi-bar in room, selected premium beers, spirits, cellar wines and champagnes, laundry, two games drives daily, game drive refreshments and snacks, specified inclusive safari activities, Skukuza Airport transfers, Wi-fi. 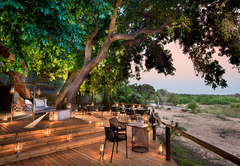 Laundry, premium brand beers, spirits, cellar wines and champagnes, cigars and cigarettes, all flights and transfers (other than Skukuza Airport), gratuities, telephone calls, boutique purchases, spa treatments, Sabi Sand and KNP entrance fees and guest conservation contribution. 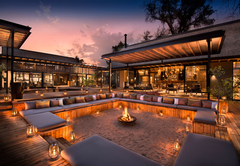 Cigars and cigarettes, all flights and transfers (other than Skukuza Airport tansfer), gratuities, telephone calls, boutique purchases, spa treatments, Sabi Sand and KNP entrance fees and guest conservation contribution. 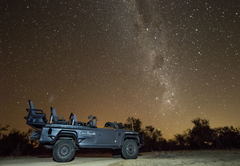 Game drives, Bush walks, hippo experience, stargazing, wildlife lectures, bush breakfasts, picnic lunches, bush dinners, Henna Pre-School visit (excludes weekends, school holidays and public holidays). 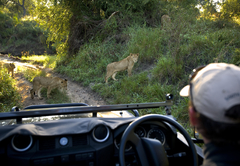 Treehouse experiences, private open safari vehicle hire, helicopter flights, golfing. 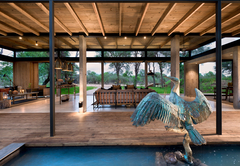 Get ready to be thrilledfrom the moment you enter the Lion Sands Game Reserve. My husband and I were welcomed by a leopard settling down for an afternoon siesta. Later as we were having lunch on the deck of Lion Sands River Lodge, a herd of elephants joined closeby. The room was spacious . Listening to the myriad sounds of nature in the outdoor shower was a welcome change from the city's humdrum. The game drive was exciting and our guide experienced - we followed a leopard as it criss-crossed our path. Hippos swam by in the river and python sat by it. There was a night drive in which we tracked a lioness on its hunt. More surprises were in store as we headed to tree house for the night. We had not expected such luxury under the open sky . Equipped with plenty of food from hot casseroles, water, flashlights, walkie-talkie for emergencies, a huge umbrella in case it rained ( it dd not), the tree-house was a dream come true. Watching impalas and a solitary hyena and listening to the jungle sounds at night was a once in a lifetime experience. The full-moon and twinkling starlit night gave way to the glorious morning sun which smiled as we woke up with the sky.directly above us. That afternoon as we were enjoying a sundowner, while on the game drive, there was a call on the walkie-talkie and soon we off at top speed to see a pack of wild dogs which had entered the reserve. Our dream of seeing the elusive African Wild dog came true. Next morning as we headed back to Johannesburg for a flight to India, the same pack of dogs bade us goodbye. Needless to say we had a wonderful time at LionSands and we hope to go back again. Thank you. Our stay at Lion Sands has been the best holiday we've ever had. We saw an enormous range of animals and each day we saw something new. Our Ranger, Deiderik and Tracker Kruger were fantastic. They taught us so much about the different species as well as entertained us with their good humour. Our Butler Elliot had the best smile (and giggle) and we enjoyed mealtimes around him. Food was superb; service excellent. Can't wait to return again one day!!! Child policyChildren over 10 years welcome.